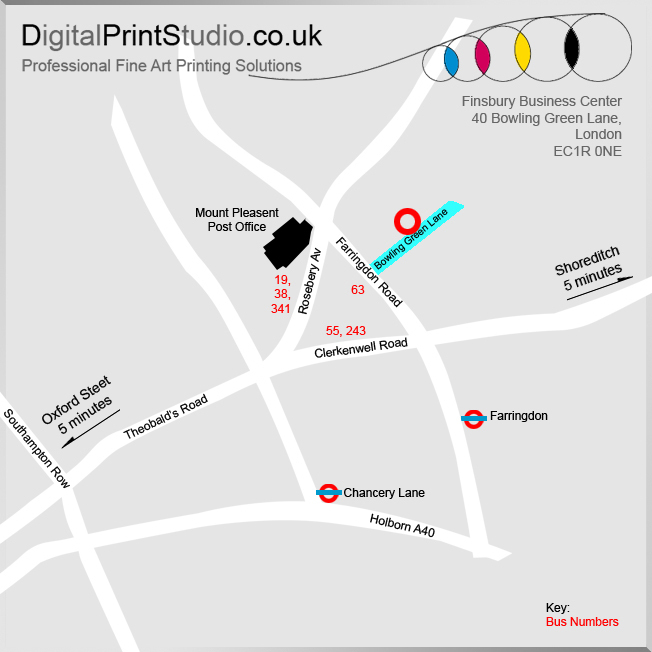 Digital Print Studio is dedicated to producing high quality, archival giclée digital prints for Fine Artists, Photographers and Designers. • The machine uses the new highly acclaimed K3 Ink set. • NOW printing to a width of 162.5cm and no limit to height (only the roll length limit's this). • 5 minutes by bus from Shoreditch. • 10 minutes by bus from Oxford Street. • 5 minute walk from Farringdon underground and mainline station. • Ample motorbike and car parking outside. • Click to book an appointment. • Glossy and Matt Photographic media. • We will test any media, allowing you to achieve your visions. • Walk in and take away service available. • Quality is our priority. Printing only at the highest possible dpi for each media type.